Do you find the legal aspects of the music business daunting? Are you seeking recording contracts or other business relationships, but you have financial concerns over the costs of attorneys? Have you, like many musicians, had a bad experience or bad impression of entertainment attorneys? If you're ready to address these issues and embrace the responsibility of your career, let this guide be your legal companion. By taking the time to become well informed and prepared, you'll be able to work better with an attorney to suit your style and specific needs. In an effort to get to the core of the legal issues without confusing you, this book is very straightforward. You'll get an introduction to all the legal subjects you should know and how to deal with attorneys. You'll gain an understanding of the four main contracts used in the music business-- recording artist, songwriter, artist management, and performance-- which are explained in simple, easy-to-comprehend terms. Furthermore, you'll get guidance on how to make the experience with your current attorney, or future attorney, more fruitful, and more time- and cost-effective. 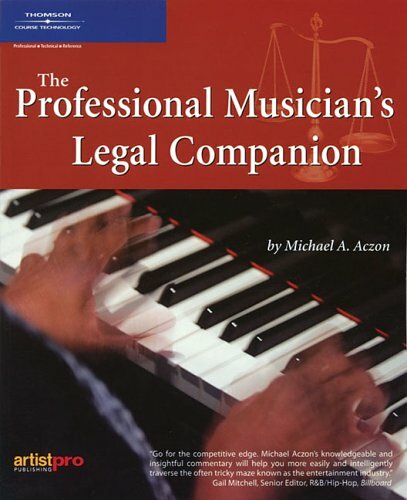 With more than 20 years in this business, interacting with many musicians both personally and professionally, Michael A. Aczon shares the many lessons he's learned and takes you on a journey to a better legal understanding of the entertainment industry and your music career. If you have any questions about this product by Brand: Artistpro, contact us by completing and submitting the form below. If you are looking for a specif part number, please include it with your message.